Nested stacks are stacks created as part of other stacks. You create a nested stack within another stack by using the AWS::CloudFormation::Stack resource. As your infrastructure grows, common patterns can emerge in which you declare the same components in multiple templates. You can separate out these common components and create dedicated templates for them. Then use the resource in your template to reference other templates, creating nested stacks. 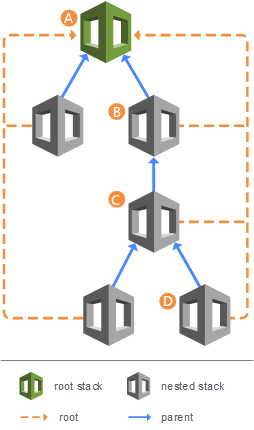 For example, assume that you have a load balancer configuration that you use for most of your stacks. Instead of copying and pasting the same configurations into your templates, you can create a dedicated template for the load balancer. Then, you just use the resource to reference that template from within other templates. Stack A is the root stack for all the other, nested, stacks in the hierarchy. For stack B, stack A is both the parent stack, as well as the root stack. For stack D, stack C is the parent stack; while for stack C, stack B is the parent stack. Using nested stacks to declare common components is considered a best practice. Sign in to the AWS Management Console and open the AWS CloudFormation console at https://console.aws.amazon.com/cloudformation/. Select the stack that you want. Nested stacks display NESTED next to their stack name. On the Overview tab, click the stack name listed as Root stack. Sign in to the AWS Management Console and open the AWS CloudFormation console at https://console.aws.amazon.com/cloudformation/. Click the name of the root stack whose nested stacks you want to view. Look for resources of type AWS::CloudFormation::Stack.